As you might recall, France qualified for this tournament in rather controversial circumstances, squeezing past Ireland in the playoff after finishing behind Serbia in the group phase. The Thierry Henry handball may have slightly taken away from the wider issue at hand – the fact that France were very poor throughout qualification. Coming second in the group was not a disgrace – they only lost once, they were seven points clear of third-placed Austria, and they were up against a Serbia side that was far better than expected. But even when France won, they failed to convince. Two 1-0 wins against Lithuania and another against the Faroe Islands tells the story of the campaign. 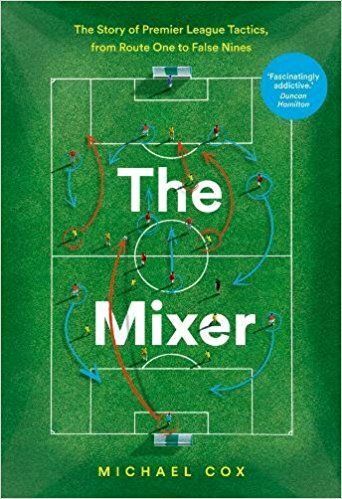 Frankly, it is difficult to expand on the content of that excellent article, which sums up the problems Domenech faces very well, so instead we’ll analyse some screenshots from their pre-World Cup friendlies, and have a look at how their system operates. Before that, it must be said that it is difficult to judge how well the shape works, because of the fact that France have elected to play pre-tournament friendlies against relatively weak sides that haven’t qualified for the World Cup. That is not to say that the performances are in some way invalid, but a recognition that in games where France dominate possession (61%, 71%, 69%) playing Malouda and Gourcuff in central midfield roles is unlikely to be much of a problem. The difficulty may come when France are faced with a Mexico side that get plenty of men forward and retain possession excellently, or a Uruguay side that string five across the middle and also have a forward dropping deep, which might force Malouda and Gourcuff into primarily defensive roles. One final point before the images – Domenech has played the same system and the same starting XI in all three of his pre-World Cup friendlies, suggesting that the team is nailed-on to start the first game against Uruguay – although the results of the friendlies have been disappointing – a narrow 2-1 win over Costa Rica, a 1-1 draw with Tunisia, and a 1-0 defeat to China. France’s new system has been widely described as a 4-3-3, but could equally be termed as a 4-1-4-1. The above shot shows France not in possession; Frank Ribery and Sidney Govou drop level with Florent Malouda and Yoann Gourcuff (blue). Nicolas Anelka is the lone striker (pink) and Jeremy Toulalan takes up a deep position behind the four midfielders. The same situation can be observed above. There is nothing unusual about the wingers in a 4-3-3 having to drop into a defensive role when not in possession, nor about one man in the three-man midfield playing deeper than the other two. However, the wingers do have a much deeper starting position than you would expect to find in a 4-3-3, whilst Toulalan clearly plays much more withdrawn role to his two midfield colleagues, and gets forward less. As he does when playing upfront alone for Chelsea, Nicolas Anelka looks to drop deep in something approaching a false nine role. Above, marked in pink, he drags one centre-back out of position as he comes towards the ball, but no France player naturally exploits the space – Govou sticks to the wide-right position, whilst Ribery rarely makes off-the-ball runs towards the centre. Florent Malouda has admitted that a place in a central midfield three does not suit him, and he tends to drift towards his preferred left-sided position anyway. This can cause a bit of congestion on the left flank for France – with Patrice Evra (green), Malouda (blue) and Ribery (yellow) all looking to work in a similar position when France counter. This shows why Malouda (in blue) dislikes his position – he is often forced to pick the ball up in the middle of his own half, a long way away from being able to influence the game in the final third. Finally, Toulalan (in red) occasionally looks to become a centre-half and drop between the central defenders (in purple), allowing the full-backs (in green) to push on. This seemed to happen less frequently in France’s recent friendly defeat to China; although in theory the situation works well in defence – with two attacking full-backs and two centre-backs comfortable on the ball and not alien to playing at full-back – the next ball becomes difficult, as neither Gourcuff nor Malouda naturally come deep to receive a pass from Toulalan, as shown by the fact neither are within 25 yards of him in this shot. the injury to lassana diarra exposed how few good central midfielders france have to choose from. this formation looks like it will pose a great attacking threat on paper, but in their friendlies in the last few weeks, france have been playing even worse than in qualifying..
interesting comments from malouda yesterday, saying that this formation needs to be fluid, but certain players (i’m guessing ribery) won’t cover spaces or do the necessary defensive work. he said that certain players would rather stay upfield, look good, and get good ratings in the newspapers. this suggests that the team spirit isn’t great at the moment, which is an explanation for why they are playing so far from their potential. I agree with the thought in Tom Williams’ article that dropping Govou for Diaby and having Malouda-Anelka-Ribery (even though he wants to play on the left) as a front three would be better for the team. Govou’s defensive discipline would be lost but there’d be a more defensive central player to compensate. It’d certainly make them more combative in the middle. I tend to agree. Malouda’s clearly not at his best playing in the middle like that, and as the France player who’s had (clearly) the best season, you’d hope to see him where he can really influence the game in the final third…three goals in the warmup games suggest they need him further forward. I have no idea what Malouda is doing in the centre… in his few games at the end of the season he played in that position for Chelsea he was pretty average, gave the ball away a lot, hardly involved and didn’t really understand the defensive demands of the position… luckily he had the experienced SFL partnering him. I’d personally go for Diaby and move Malouda AML. As I said in Tom’s article, Malouda and Ribery play in the same position and this weird formation is an attempt to accommodate them both. Ribery doesn’t want to play on the right because he is better cutting in from the left.He isnt a good crosser of the ball anyway. One of these guys is clearly ignoring his role in the team. The problem for this team is that there is no one making runs into the penalty box. In the games I have seen, Gallas has been the biggest goal threat……….from set pieces. True enough. Domenech has said that the formation is a 5-5. Not sure which half Gallas is in. Great stuff mate, and thanks for the hat-tip. The 4-1-4-1 defensive phase shape is a good observation and the fourth image perfectly illustrates how France’s attacking play is heavily weighted towards the left. Something tells me the 4-3-3 might not be a certainty for the first match though. France used a 4-3-1-2 system in all of their warm-up matches before the last World Cup (with Zidane playing behind Henry and Cisse), but switched to a 4-2-3-1 on the eve of the tournament. That change was prompted by the horrendous injury sustained by Cisse in the final warm-up game against China, but it does show that Domenech is prepared to rip up his plans at the last minute. Just a minor error here. In the first match the starting keeper was Steve Mandanda, while Hugo Lloris was responsible for the last two matches. Of course Lloris is the #1 keeper, so the first match was mostly a story of rotation. 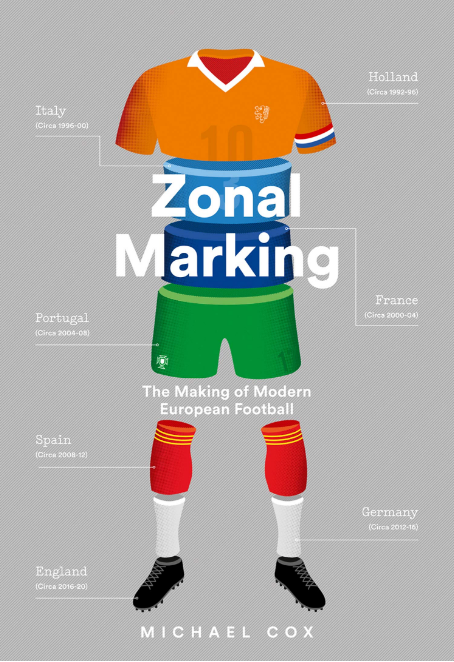 Fellow Zonal Markers, I’d like to see if the tactical ponderings translate to scoreline guessing and so have created a prediction league called “Zonal” with “marking” as the password at http://leikir.betra.is/wc2010/ . As explained on the front page there it’s a free, non-spam game that has been going on sporadically (during major tournaments) since Copa America 2004. As a tactics enthusiast I frequently lost out to my non-tactical mum during the Euro 2008 tournament… so I’m interested in seeing if this was a freak occurence, or if these tournaments are so unpredictable that a random guesswork produces better results than tactical analysis! Apologies to the Editor, if the name of the private league is termed theft I can change it, but of course hope to see you there as well! That picture of Ribery, Malouda and Evra in the same 2 meter space is priceless. Very interesting. I largely believe that diaby should come in for govou; malouda shifts lefts and ribery goes right. In the game against china, diaby had so much influence in the game when he came on. He tracked back to tackle and he got the ball forward and cracked some shots. In fact, he was unlucky to get a goal. I strongly believe a midfield of Malouda–Diaby–Goucourff–Ribery would work wonders both in terms of attacking and defending. Domenech should get the wake up call. france also have alou diarra in the squad a pretty decent defensive midfielder in his own right. if they want they could probably play a defensive 4231 and have gignac available to play a 442 if needed. Another thing is malouda is a great player but if he doesnt fit into the system he might work better in some games as a way to stretch a tired defense and hammer through weaker fullbacks. for instance france could easily play a system involving gourcuff and ribery behind either gignac or anelka with a midfield trio of toulalan, alou diarra and diaby, quite a solid formation and with frances plethora of attacking fullbacks width shouldnt be a problem. if a goal doesnt come then easy enough to bring in lets say malouda for a DM shift gourcuff deeper and ribery to the right and so on. france needs to fix its inability to do anything in the midfield, too often it lacks creativity, at worst just force the work to the fullbacks, as long as you have essentially 3 DMs covering counter attacks shouldnt be a problem and diaby has slightly attacking tendencies anyway. Nasri would have been perfect for this formation. Waiting to see Cisse scoring. He is in great form! may I suggest a small layout addition, featuring country flags linking to the articles, ideally organized by world cup groups? Was going to do something similar – thanks for the flags! Ribery looks pretty dangerous on the left, but I think he is to blame for not sticking too much to wide positions and not using the space freed by Anelka when he goes deep, as a proper reversed winger should do. As for Malouda, he is close to 30 and his pace is expected to drop in the coming years. It would probably be a good idea for him to adapt to the CM role, as he is strong for a winger. Talking about bad luck, I only saw today the bits of France vs China, and it seemed a very weird game indeed. France shot on goal around 20 times, being very close to score a good number of times. China had 2 shots, and the goal was pretty strange : the free kicks swerved in several directions successively. Did someone said that these balls were weird ? Domenech is a strange guy…. His selections baffle me at times..
No Nasri (He is a creative midfielder on a good streak also)…. Nasri’s one of the best midfielders in the PL, so it’s strange not to include him. I understand maybe not wanting both him and Gourcuff to start together, but as an impact player from the bench he would have been a fantastic option. Domenech had said he wouldn’t pick Nasri unless he was regularly playing as the central playmaker and not playing out wide. Nasri didn’t play many games there over the season so Domenech didn’t pick him, but that was before Diarra dropped out and the change in tactics (But by that point it was too late I guess). Then again, isn’t this the guy who didn’t like playing certain players together due to their star signs? Domenech is why it wouldn’t surprise me if they crash out in the first round. They do have a history of it–2002, and the Euros in 2008, with Domenech’s bizarre substitutions against Italy. The home side always qualifies for the 2nd round (and Mexico has made the 2nd round four times in a row). While it sounds crazy, South Africa’s results are no worse than the USA’s were leading up to 1994. To my understanding, Nasri was dropped because he was causing internal troubles in the French squad. Sometimes for the sake of team spirit, you just need to cut the players, even if that lead to a weaker squad. And if you look at the squad, Nasri is quite far from irreplacable. That’s true. Nasri and Benzema both failed to gel with the team at Euro 2008. I think there was friction between Benzema and Henry in the last game against Italy and Gallas wrote in his own autobiography that he couldn’t stand Nasri, likewise Nasri told the British media that five or so Arsenal players don’t speak to Gallas. I think Domenech was faced with the decision to pick Henry/Gallas or Nasri/Benzema, and he went with the former. Good team spirit is definitely more important than individual reputation. Anyway France have a history of leaving out star players at will. Look at Ginola and Cantona. What, no one’s whinged about France being in the wc yet? I’m amazed. According to the Irish, they would ABSOLUTELY POSITIVELY be in SA right now if it weren’t for that cheating Henry (that Keane handball in the same game and Ireland’s fake penalty v. Georgia doesn’t count as cheating I guess). Of course the fact that the game was 1-1 and heading to penalties seems to have been forgotten. Anyway, excellent article — very welcome with all the simpleminded francophobia on offer all over the net for this tournament, and will definitely be there for as long as France last in SA (which no one expects to be very long). why cant ribery just play on the right? Consensus is he’s better from the left but there’s no reason he and Malouda can’t switch flanks in-game to shake things up. Ribery needs to just deal with it on this one, I think. everything being said here seems so right, it’s just extraordinary to think that France’s manager doesn’t get it. i already think ribery on the left, with his inability to move inside off the ball, restricts one of france’s most dangerous attacking outlets in evra/clichy. so playing malouda in the left central midfield role, given his tendency to drift out there too, is just plain bonkers. it would be like del bosque picking fabregas, xavi, iniesta, alonso and busquets all in central midfield. the only position in this team for ribery is the right side of midfield, perhaps alternating occasionally with malouda on the left. if ribery doesn’t want to play out on the right, leave him out altogether. When Ribery plays on the left he will be drifting inside to shoot with his stronger right foot, and this would make room for Evra. But if Malouda also commes thundering into the same area I agree that there might be a bigger problem. With Malouda on the left they’d also have someone able to make a run from outside to inside without the ball. Ribery doesn’t really do that. He just waits for Evra to overlap (which ofcourse isn’t a bad thing, but you can’t be predictable) so he can cut inside. - Ribéry is really better on the left side, for several reasons. He has never been a good crosser and he cannot score when he plays on the right as he does when he’s on the left, that’s for sure. But there is another problem : Ribéry has always been weak in terms of defensive work and covering up. Even if Govou hasn’t been impressive during the 3 friendlies, it might be dangerous to match Ribéry against Alvaro Pereira for the game against Uruguay. For this reason among others, the 4-3-3 could be very useful against Uruguay. - Malouda has clearly been the better player during the 3 matches, even if that is not that big a performance for the games were weak. But he is clearly not lost in this role, even if he might be better in more advanced position. - Henry has been really good on his last 30 minutes against China. I would not be surprised if Robert Duverne, who did miracles with Zidane and Vieira in 2006, had prepared him to be fit for the World Cup. And that would change a lot of things for France, because a good Henry could play as a striker, maybe with Anelka behind him or on the right. - I think that Diaby will make his way to the starting XI. Maybe not against Uruguay, but for the second game against Mexico. Then Malouda would probably play on the left, but that doesn’t mean Ribéry will play on the right, and it is quite possible that he will play most of the World Cup simply as a 10, just as Zidane did 4 years ago. In 2006 Domenech really found his team after the first round, against Spain. I think France is even more unpredictable than you said : the shape of the team will change more than one times. But the result might be surprising too, as it was in 2006 (and hopefully even better ). As well as the problem of Malouda being out of position, I think France’s defence is a major issue. I don’t think Abidal has the quality to play in the centre of defence at the World Cup, Uruguay and Mexico’s forwards will definitely pinpoint him as the weak link. He said he’s not fully comfortable in the centre with Gallas, and I’m sure their opponents will exploit that lack of understanding. I’m also not sure how fit Gallas is, and Sagna’s recent form for Arsenal is below par. I have a suspicion Lloris will be extremely busy, and France will likely concede a few goals in their group matches. And if they do concede a goal, do they have the quality to score 2 vs Mexico or Uruguay? I’m not sure they do. I really think a first-round exit is very possible. As quite a few people have already mentioned Govou should be played against stronger, more offensive teams. Against teams like China, and then South Africa in the Group match, there should be a more offensive option on the right. This can either be Anelka with Gignac upfront, or even Cisse. I would prefer if Valbuena bring his brand of creativity off the bench. There are very few positives to take into the World Cup as a fan of Les Bleus, one thing is that there are absolutely no expectations. Everybody in France is already looking forward to the Blanc era, this worldcup has become something of an afterthought. In fact, I think most people don’t even expect France to get out of the 1st round. If France can start well, which they normally dont, then a quarter final with England beckons and let’s be honest, if there was any of the so-called contenders we could choose to play, its probably England. All said and done, I think we will be dumped out in the round of 16, which unfortunately is an honest reflection of where this France team lie in the world of football – a top 15 team, not an elite powerhouse which is where they should belong when you consider the level of talent. France will face a lot of of 3 man defenses in their group so this 4-3-3 is an attempt to counter that. Even South Africa play with wingbacks so Govou will have an important role in tracking them. I can see France switching back to 4231 in the knockout stages (if they get that far). I would’ve thought the more natural option would be to play Malouda on the right / Ribery on the left? I think this is something to consider aswell. This way, both Malouda and Ribery can cut inside on their stronger foot and the fullbacks can bomb forward and have plenty of space. But Malouda might be negative to this change, as it seems he is when he is choose to play in midfield. I allways find it strange that footballers complain when they have to play out of theire favorite position. Afterall all the managers is doing is trying to improve the team. I agree. Two inverted wingers would be best for France since we don’t have proper wingers who can whip in crosses, but instead good dribblers offering decent goal threats across the pitch. Diaby would be a good replacement for Malouda in left midfield as he could take up Ribery’s defensive duties as well as help defending on set pieces. I don’t think Malouda ever liked or even tried to play on the right side. I think this French squad is headed to another tournament disaster. The only question is how soon will it happen? If the French team had a disciplinarian like Capello, I think he would pick Malouda on the left wing and force Ribery on the right for the benefit of the team just how he uses Gerrard as a roaming left midfielder. There’s too many egos and unbalance in the team and it would take even more than Zidane to take this French team to the finals this time. France should play a 4-2-2-2 with Toulalan and Diaby holding behind Ribery and Gourcuff. This would give the fullbacks space to attack and with two holding mids (Toulalan and Diaby), Ribery and Gourcuff would have the freedom to get forward and create. Unfortunately Malouda is the odd man out, but it’s counter-productive trying to squeeze everyone into an unbalanced lineup that doesn’t suite the strengths of the squad.